Our Custom Imprinted Champagne Flutes are perfect for bars, restaurants, clubs, fraternities/sororities, promotions, and much more. You can choose from four different Custom Champagne Flute styles, including our popular 6-1/4 oz Sophia Champagne Flute and our 8 oz Connoisseur Champagne Flutes. We use a kiln-fired imprinting process – at heats up to 1,200 degrees – to ensure that your imprints are durable and long-lasting. Your satisfaction is guaranteed when you order custom glassware from us. 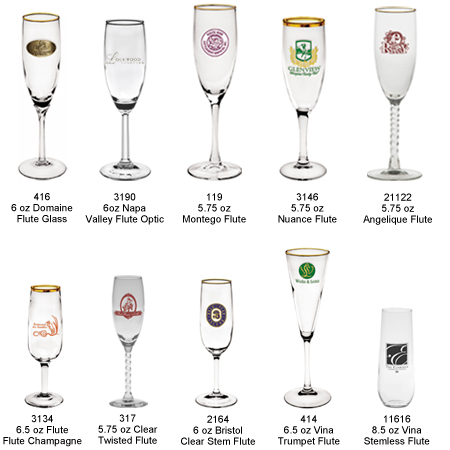 Pricing for Custom Champagne Flutes – Call 1-800-233-0828 for more info or to order! 416 6 oz Domaine Flute 3.81 3.41 3.26 3.16 3.06 2.86 2-3/8" 1-3/8"
3190 6 oz Napa Valley Flute-Optic 2.54 2.19 2.10 2.03 1.97 1.83 2" 1-1/4"
119 5.75 oz Montego Flute 3.75 3.36 3.22 3.12 3.02 2.81 1-13/16" 2-3/8"
3146 5.75 oz Nuance Flute 3.06 2.69 2.58 2.50 2.42 2.25 1-13/16" 2-3/8"
21122 5.75 oz Angelique Flute 3.80 3.39 3.25 3.15 3.05 2.84 1-13/16" 2-3/8"
3134 6.25 oz Champagne Flute 2.84 2.44 2.34 2.28 2.21 2.08 2-1/2" 2-1/8"
317 5.75 oz Clear Twisted Flute 3.17 2.79 2.67 2.59 2.51 2.34 1-1/2" 2-1/4"
414 6.5 oz Vina Trumpet Flute 4.43 3.99 3.82 3.70 3.59 3.35 2" 2"
11616 8.5 oz Vina Stemless Flute 3.38 2.99 2.86 2.77 2.69 2.51 2-1/2" 1-3/4"
Swipe left and right to see table. It's easy to have your own Custom Imprinted Champagne Glasses. Simply call 1-800-233-0828 and submit your camera-ready artwork to graphics@kardwell.com (you can also mail your art). The minimum order is just 72 Glasses and Process time is about 3 to 4 weeks. Rush delivery is available. For a FREE Catalog or information on custom imprinted glasses, please contact us at 1-800-233-0828.